This past week I went on vacation with my family. We went to Orlando, Florida. We flew which is unusual for us. My parents usually drive us to our vacations. It was fun in the airport. Ours has a train, colorful tunnel and cool fountain. Once in Orlando, we took a bus to Fort Wilderness to meet my grandparents. They joined us on vacation. The next four days I was at Disney World Parks. It was very fun. My favorite ride was Haunted Mansion. At Animal Kingdom, it was Primeval Whirl. Also in Animal Kingdom, I liked the raft ride a lot! You can also do a fun activity called Wilderness Explorer throughout Animal Kingdom and learn about nature and conservation. I did a few activities but Little Brother did the entire book. He earned his Senior Explorer Badge. In Disney Springs, we found a bakery that was ok for my brother and I to enjoy. We go cupcakes and donuts. They were so yummy. So look for Erin McKenna’s Bakery if you have allergies. We also spent one day at Kennedy Space Center. It was very fun and neat to see real space ships. We went to the launch sites too. The best part of my vacation was drumroll please…. meeting Mike Maihack! He held a talk at a library just so we could finally meet. He does a really good job explaining story telling and his process. He did reveal I have to wait longer for Cleopatra 5 (😭) but promises it is worth the wait. Now I am back home. Tomorrow I go back to school – boo. I want vacation to be longer! The Red Balloon Bookshop is a super cool bookstore in St Paul. I would have a million books if that was my bookstore. The whole first floor was kids books! The whole floor! 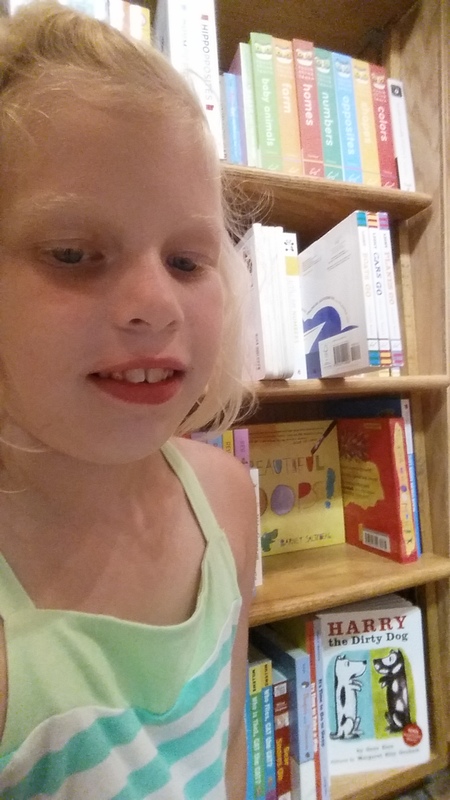 I saw books by Aimee Bissonette, Jean Reagan, Chris Colfer and Mike Maihack. There were signs on the wall that visiting authors had signed. That was cool! I recommend you check it out if you are in Minneapolis/St Paul. They gave me great book recommendations! I went to visit Belfast and rode on the Belfast Moosehead train. They took down the Waldo Train Station. The engineer had to turn the engine around to go back. I also visited Rockport where Andre the Seal lived. They have a statue of Andre. I watched the movie of Andre with my grampy. I also went to an Animal Farm. My favorite animal was the Fisher. The animals were all from Maine. They didn’t have any giraffes. Have a great Thanksgiving! 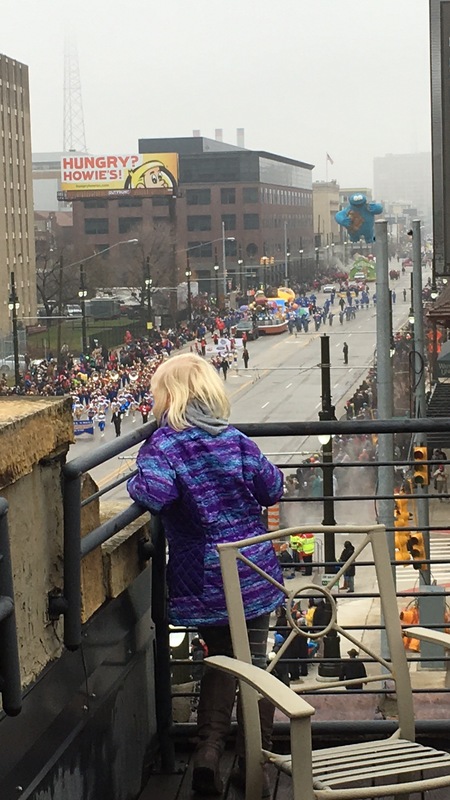 I am celebrating with my family with a trip to the parade, dinner, lots of playtime and reading! There is a really cool bookstore called Book Beat nearby. I went there today and can’t wait to return. There are books piled everywhere. It is a book lovers dream. Mom let me get a bunch of new books. One day my bookshelves will look like this store! This upcoming week will be “Comique Week” on my blog so all my posts will be about comics. Comique Con will be on Saturday and it is cool event about women in comics. Learn more tomorrow with an interview from the founder! I spent the day in Washington DC. I started it like all kids do with Absolutely Mindy on Kids Place Live. 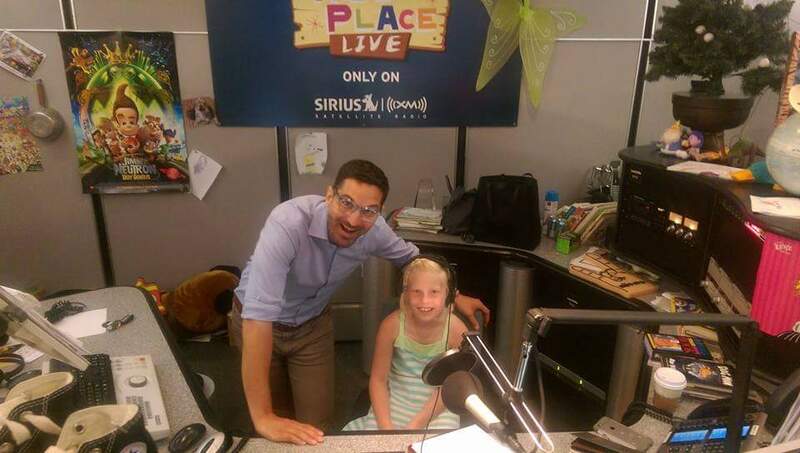 Well, maybe not all kids are in the studio and joining her on the radio. She is just as silly in person! Guy Raz was there too. I helped flush Guy down the portal potty. It is smaller than I expected. I had to climb on him to push him in. I almost fell in. I have already been flushed before. I didn’t need to go to Guy’s meeting. Mindy and Guy looked just like I expected. Kenny Curtis snuck in to say hi. He looked different than I expected. I didn’t get to say hi to Lorenzo Llama or Dirk the fourth and forgotten chipmunk. I also met Tori, Mindy’s producer. She was cool! 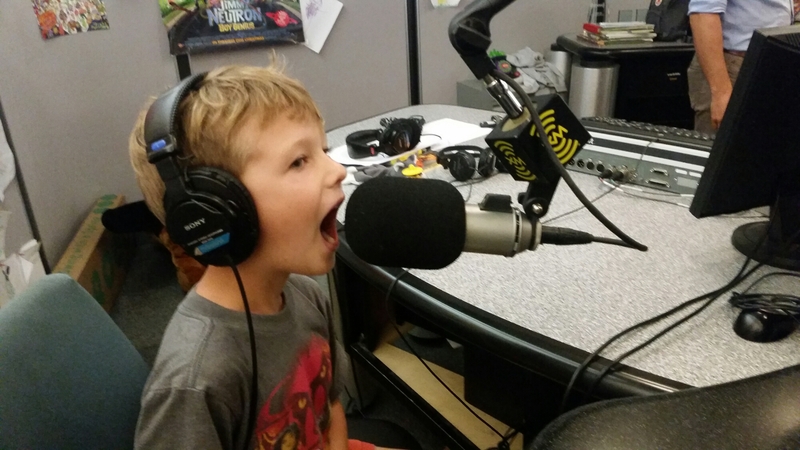 Annoying Little Brother also got to be on air and talked about Tim Kubart of course. They even tried calling Tim but got his voicemail. Phew! After our radio time, we went exploring. 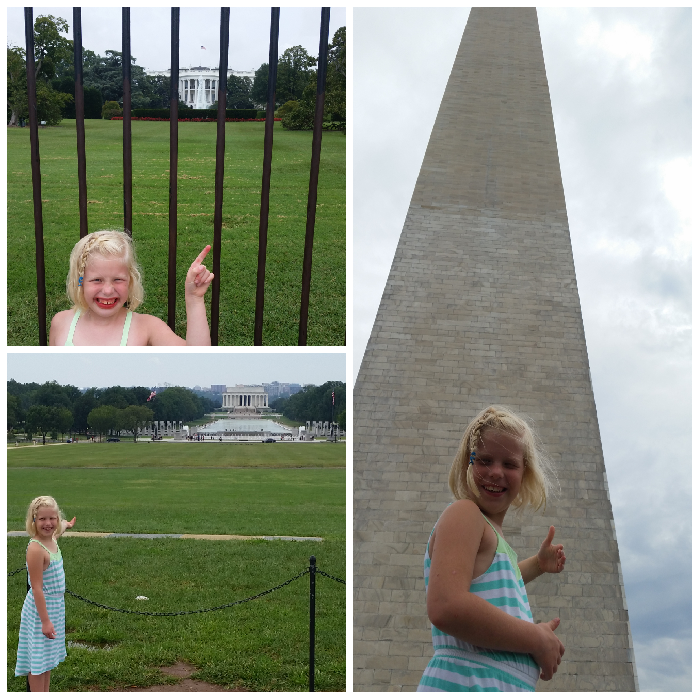 I saw the Washington Monument, the Lincoln Memorial, the Capitol Building and the White House. For lunch, we went to Kramerbooks. You can get books and food! 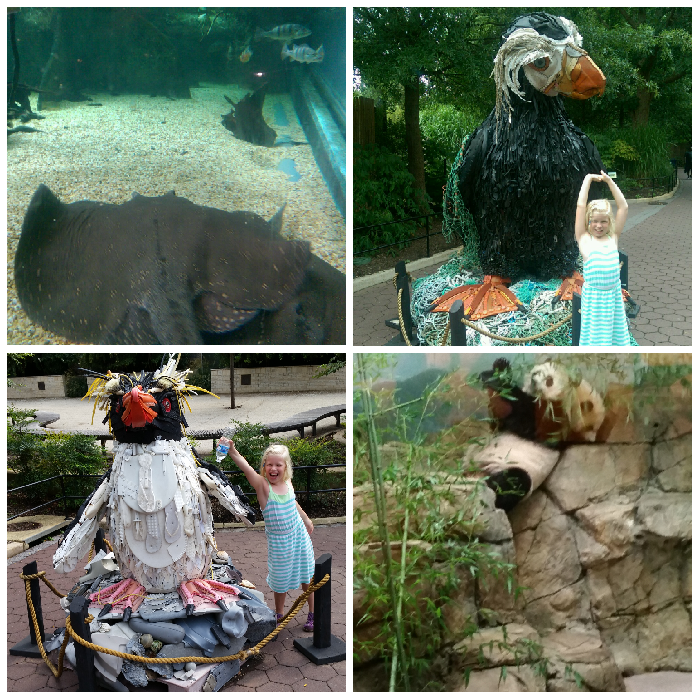 The last place we visited was the Zoo. I saw Pandas – both Giant and Red Tailed. I also saw elephants, seals, piranhas and bison. They also had statues made from trash in the zoo. They are to show people to stop throwing their trash anywhere and especially in the water. I do have book recommendations for you. If you are going to DC, you could read Miroslav Sasek’s This is Washington DC. It is a bit old but you learn about a lot of the monuments. I also suggest Kelly DiPucchio’s Grace for President. It is about a girl who wants to be president when she grows up.